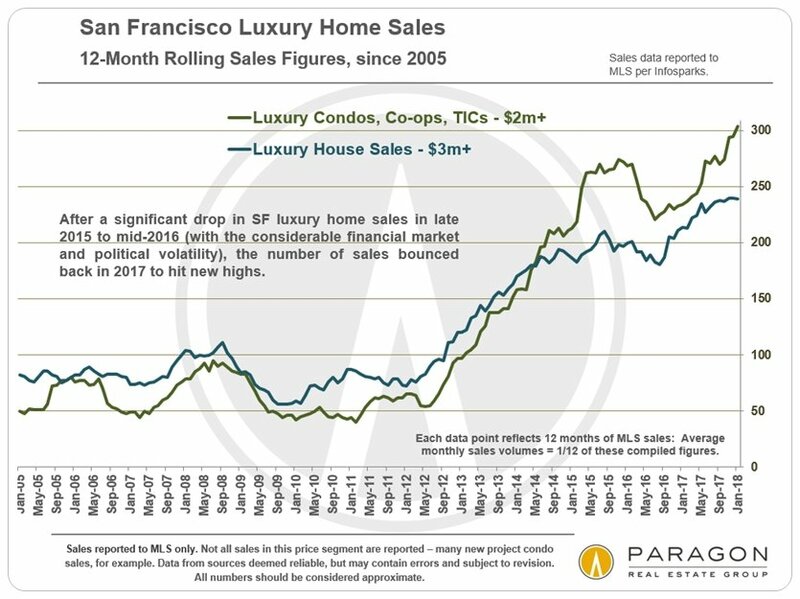 After cooling somewhat in late 2015 and 2016, the San Francisco luxury home market bounced back in 2017 to hit new highs in the number of sales. 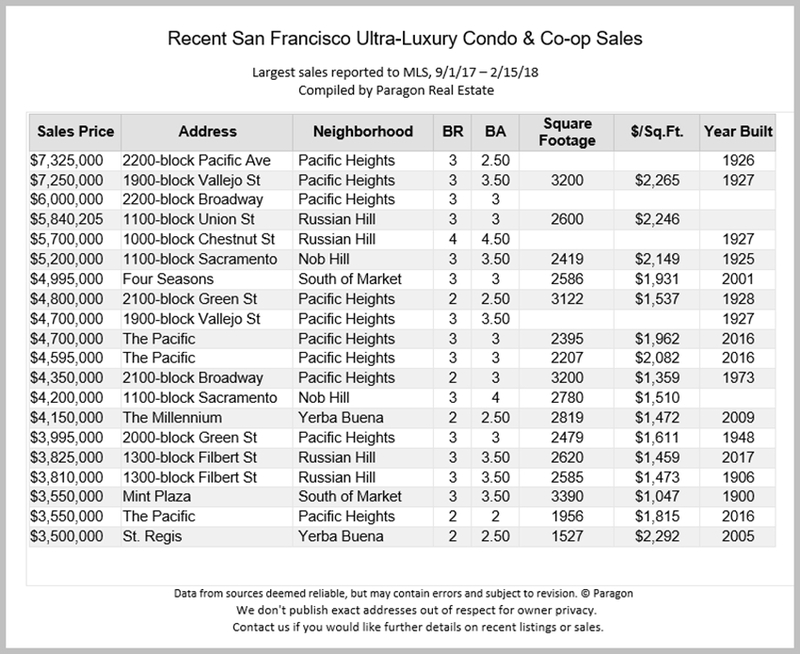 Note: Our report online contains several dozen updated analyses of the San Francisco luxury and ultra-luxury house and condo markets, of which this newsletter contains a relatively small sample. 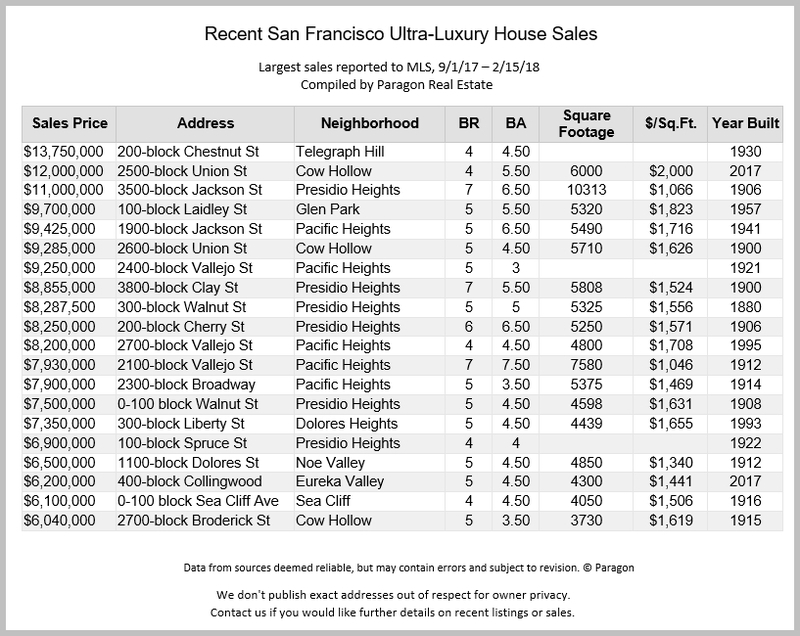 The full report is here: Paragon SF Luxury Home Report. 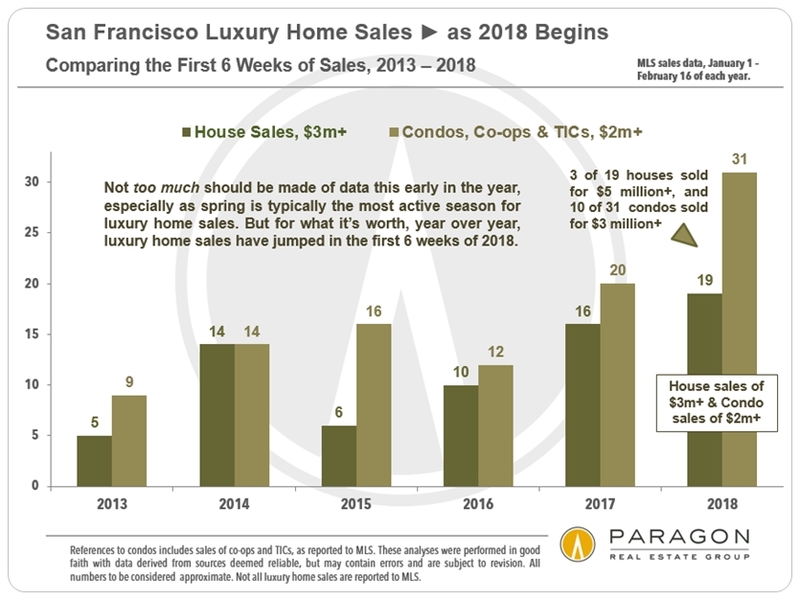 So far in 2018, SF luxury home sales have been quite strong, higher than in any previous year since the recovery began in 2012. The recent stock market volatility notwithstanding, the economic confidence that has been sweeping the nation is also showing up in our luxury home markets. For example, as of February 16th, the sales of condos, co-ops and TICs at prices of $2m and above has jumped 55% in the city, year over year, and luxury houses by 19%. However, year-to-date data is very preliminary and much more will be known once the spring selling season really gets started in earnest. Also, if the recent financial market volatility continues and becomes even more dramatic, that may cool high-end home markets (and IPO activity) as it has in the past. However, behind the positive sales statistics, inventory statistics provide a note of caution, especially for what we call the ultra-luxury home segments: houses selling for $5m+ and condos and co-ops selling for $3m+. In those segments, the supply of listings has been surging beyond demand, and many of these listings are expiring without selling. 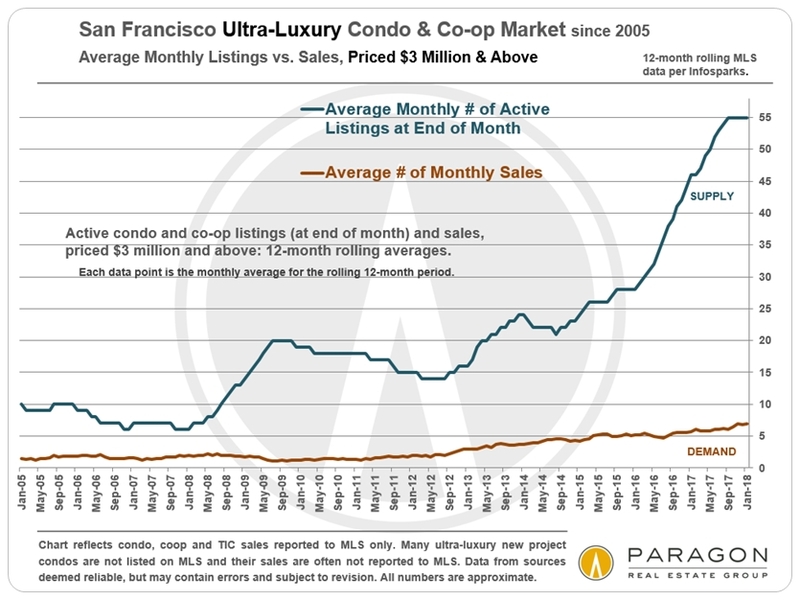 As an example of the supply and demand disconnect, ultra-luxury home sales make up about 2.5% of total MLS sales, but as of late February, they made up 12% of active SF MLS home listings (no offer yet accepted). This does not mean that some very expensive houses and condos are not selling very quickly for well over asking price, as some certainly are. 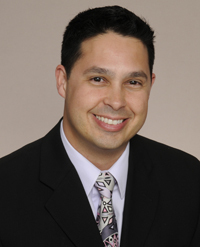 It all depends on the property, its specific location, appeal, preparation, marketing and, of course, pricing. 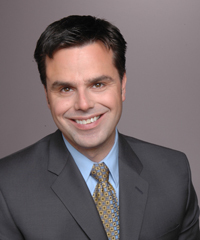 Different neighborhoods are often experiencing different market conditions, some much stronger than others. This is discussed in much greater detail in the full report online. 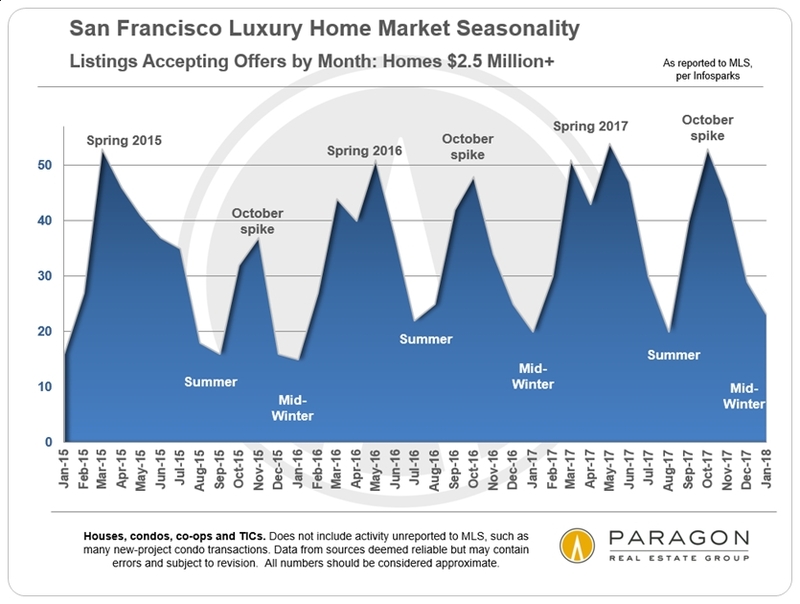 The luxury real estate market in San Francisco is intensely seasonal. As illustrated by the 2 charts below, the high-price market wakes up and heats up as the new year gets going, with spring typically being the most active season overall for sales. It then slows way down in mid-summer, spikes back up dramatically for the short autumn selling season, and then plunges for the mid-winter holiday period. Note the delay between new listings coming on market and listings accepting offers: For example, September is typically the single month with the highest number of new listings, leading to the big October spike of listings going into contract. Sales then usually close 3 to 5 weeks after going into contract. 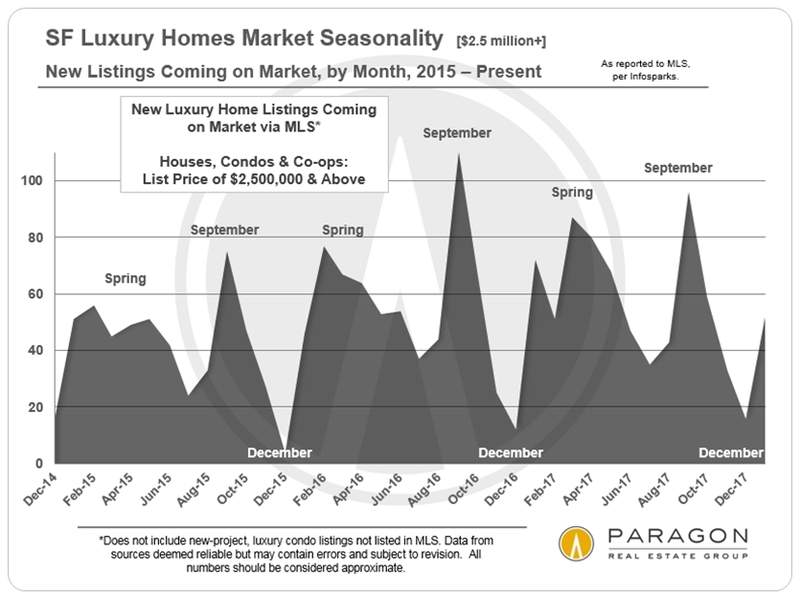 Right now is the period when new luxury listings start pouring on the market for the spring season. The supply of luxury homes available to purchase plays a huge roll in market dynamics. Supply is affected by 3 large factors: 1) the number of new listings coming on market, 2) how quickly these new listings sell, and 3) how many listings are taken off the market because they cannot find buyers (expired and withdrawn listings). 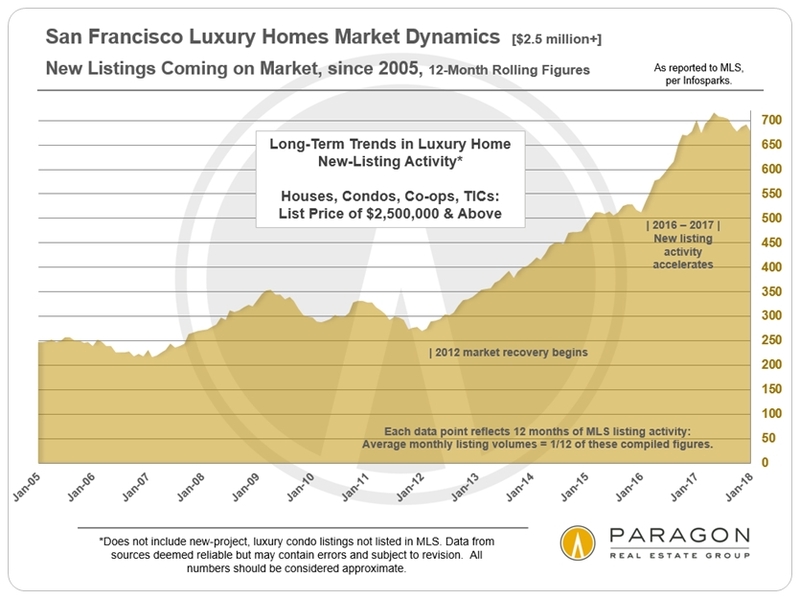 The chart below looks at longer term trends for new listing activity: The number of new listings hitting the market accelerated in early 2016 as the luxury segment was cooling due to financial market volatility (Chinese stock market crash, oil price crash, Brexit vote). 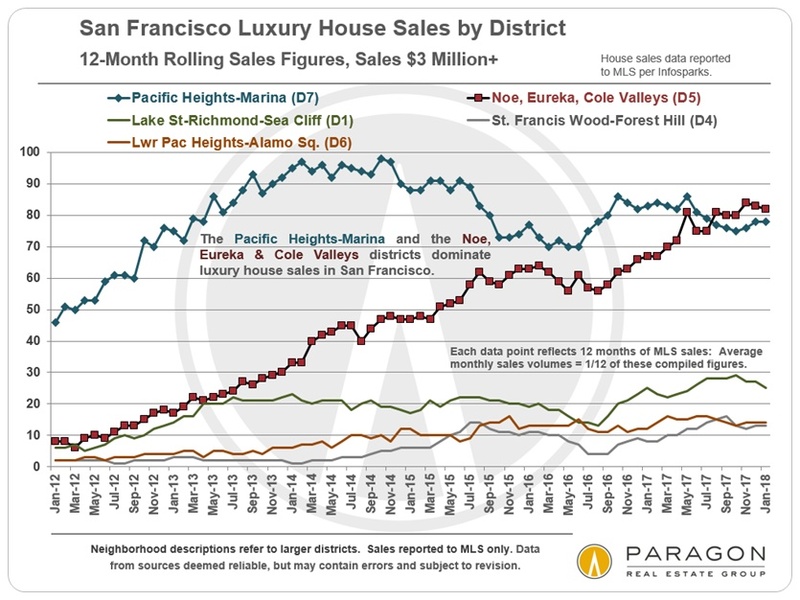 Sales of houses $3 million and above have soared in the central Noe, Eureka & Cole Valleys district (red line in first chart below) in recent years, to jump ahead of, by a tad, the wealthy, old-prestige, Pacific Heights-Marina district (blue line). These rapidly increasing sales have been fueled by younger, very affluent, high-tech industry buyers, who prefer the lower-key neighborhood ambiance, as well as the proximity to the hot Mission district and to highways south to the peninsula. 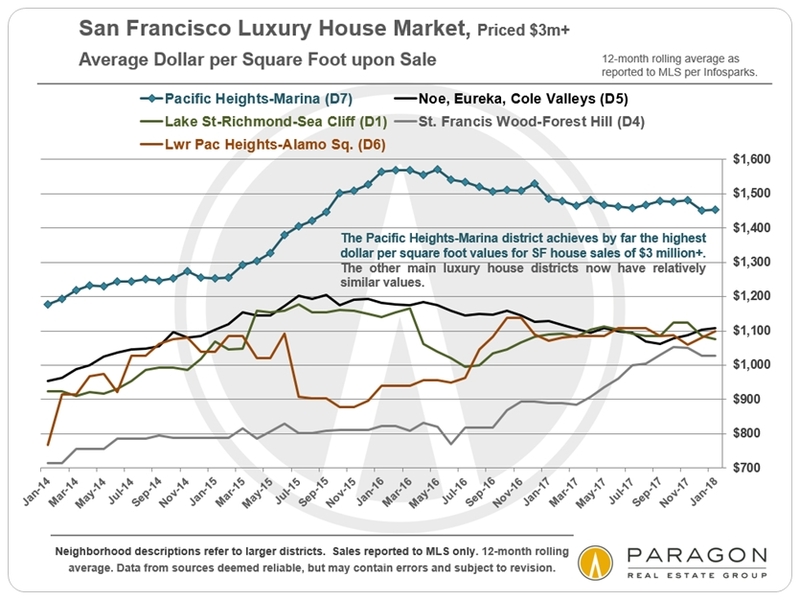 However, the Pacific Heights district still utterly dominates house sales of $5 million and above – that chart can be found in the full report online – and its houses achieve by far the highest average dollar per square foot values, as illustrated by the blue line in the second chart below. 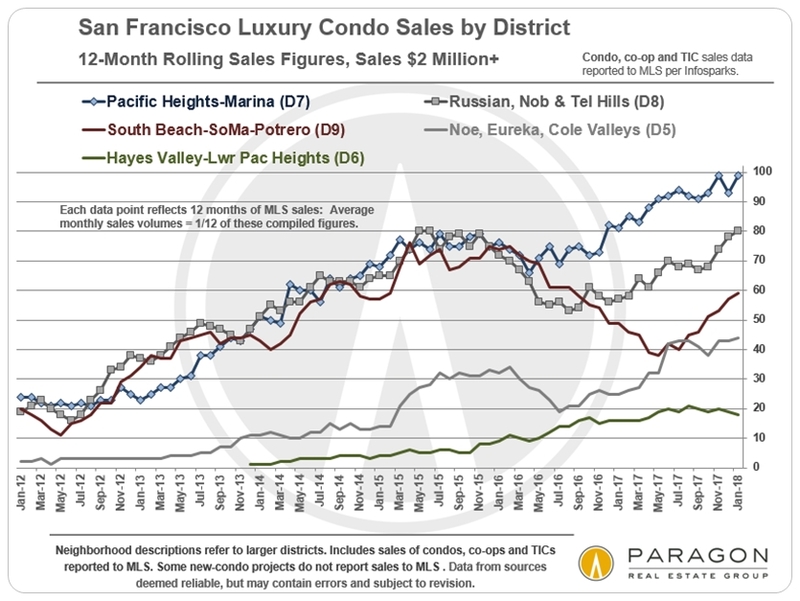 The older, high-prestige neighborhoods running across the north of the city from Pacific & Presidio Heights-Marina through Russian, Nob and Telegraph Hills have been dominating the sales of luxury and ultra-luxury condos and co-ops (the top 2 lines in the next chart). 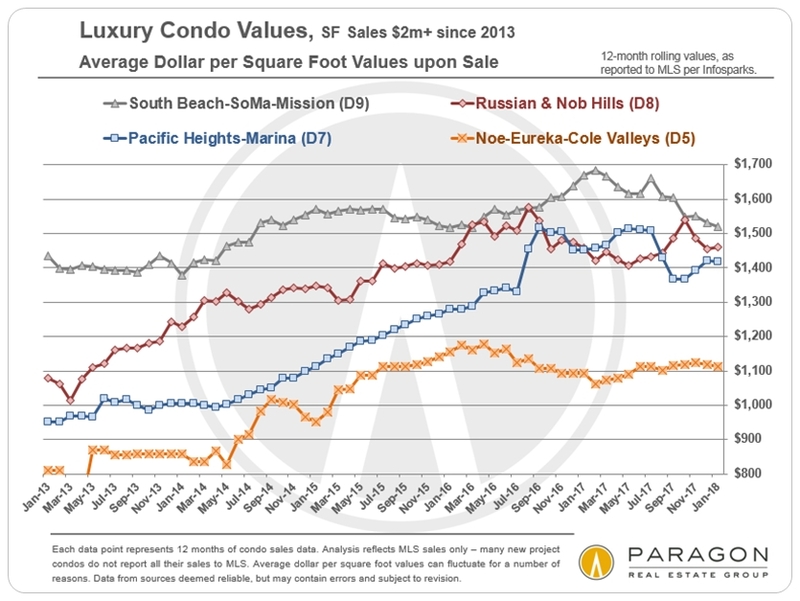 The greater South Beach, SoMa, Yerba Buena, Potrero Hill and Mission district (the third, red line) saw its sales plunge from mid-2016 to mid-2017, but has had a significant recovery since. All three of these districts see very high dollar per square foot values (second chart below). And of course, some individual sales see much higher values than the averages. How the 2018 market plays out depends on a number of factors that are susceptible to change: financial markets, interest rates, the course of the high-tech boom, whether our big, local start-ups proceed with IPOs, political developments, and so on. 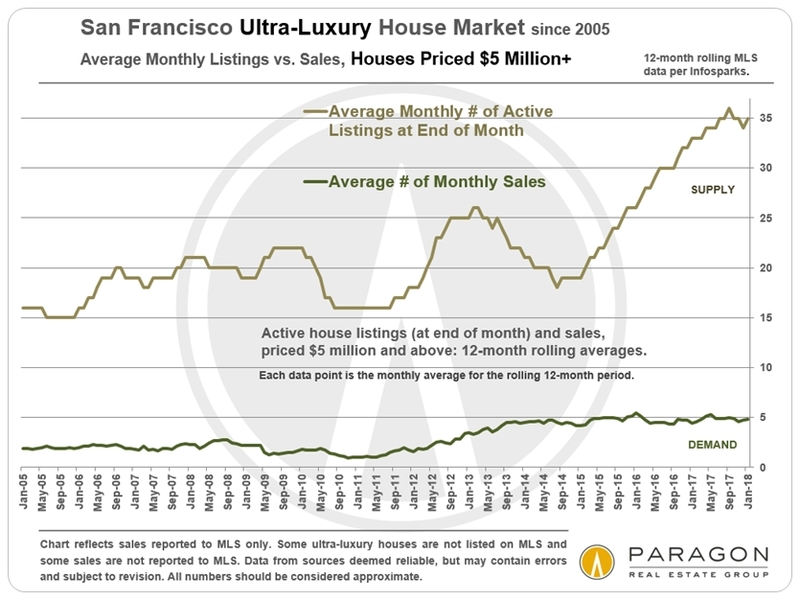 (Positive & Negative Factors in Bay Area Markets) For the time being, the San Francisco market appears to be off to a heated start characterized by robust demand. Here at Paragon, our 2018 SF sales volume is up 30% year over year, though admittedly we are outperforming the general market, which is up about 5%. 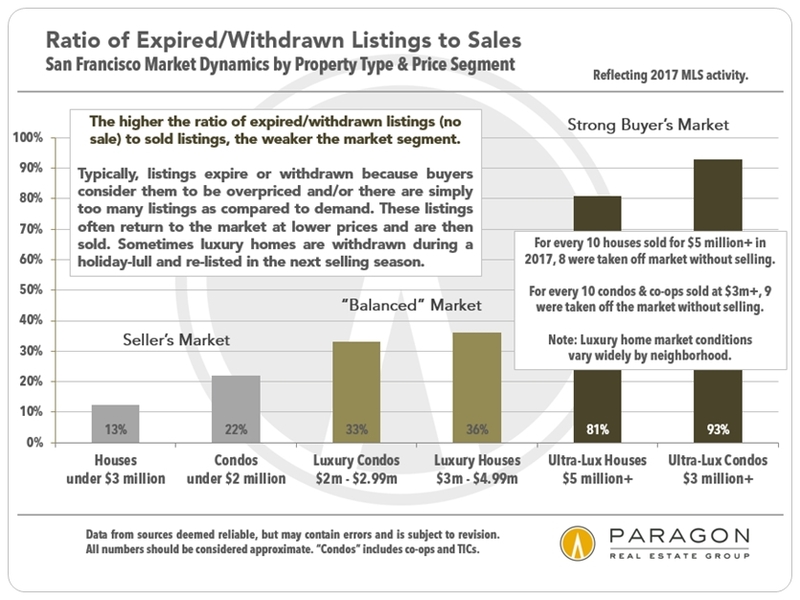 Again, the full report online contains many more analyses: Paragon SF Luxury Home Report. Please contact us if you have any questions, or we can be of assistance in any other way.